Size: 20 x 11.1 inches. 50.8 x 28.2 cm. Engraved by Baptista Doetecum. 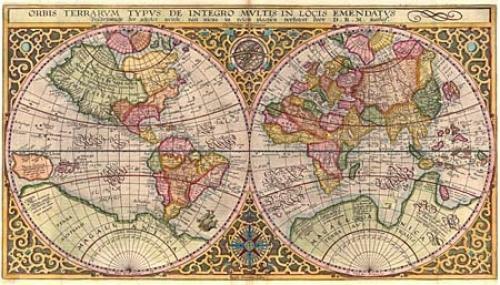 A handsome world map, first issued in 1590, and based on Rumold Mercator's world map of 1587. Plancius also incorporates the improvements made by Ortelius in 1578 with the bulge removed from South America and the inclusion of the Solomon Islands. On this map, Plancius introduced new information, based on Portuguese reports, on the north west coast of America and the western coastline of Africa. Japan is shown as one small and three larger islands for the first time. This example is state 3 from a Dutch Bible with the attribution D.R.M. Mathes. The map is set in a strapwork surround with a compass rose and armillary sphere tucked between the hemispheres. The side margins are cut quite close, as is common with Bible maps and there is a faint damp stain at the bottom centerfold that barely intrudes into the map. Overall the map is in very good condition with rich colours. Ref: Shirley 177 (noted as rare).